This time sharing a little mermaid project. The pattern comes from a squiggle made many years ago, now working on refining it. These latest mermaids are more in the Waldorf style with simple embroidered features. Another version appears in an older post, their features are sketched with pigma pen. 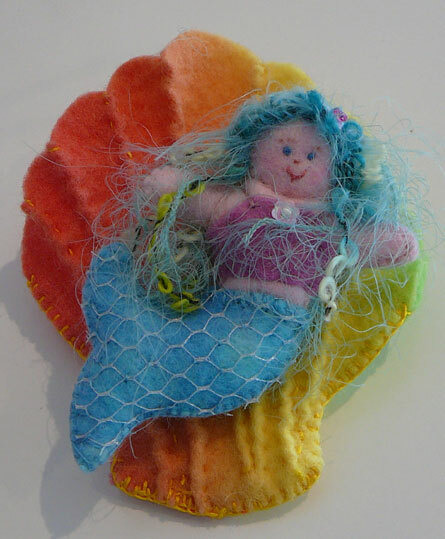 Those first mermaids frolic in a felt ocean and on a felt island. They are more of a nature table -story prop whereas these are intended to be play companions, and hopefully lead the imagination to amazing adventures and explorations. To give the effect of a fish, scaley tail silver tulle was stitched onto the base felt. These were a fun to create and a joyful contemplation giving an opportunity for quiet time to reflect whilst embellishing with hand stitching and beading. Lately the sea has been a constant source of wonder and inspiration so it was a natural consequence to delve a little into the world below,this is just a very small beginning as the ocean is vast and her wonders so many. 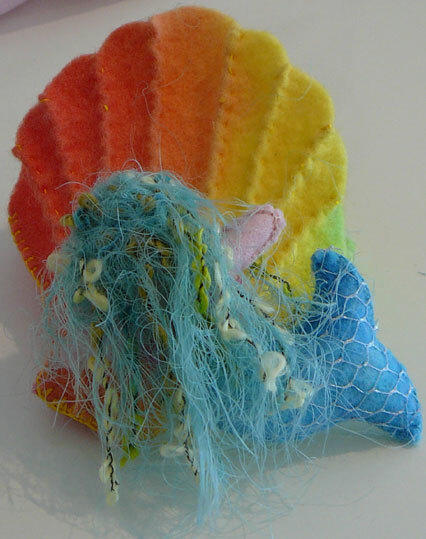 for some years and it seems needed the gorgeous rainbow felt dyed by Mia and Nikki to bring them from sketch to form. Here my interest in quilting and patchwork played a role to make them more dimensional. As with other projects texture is an important aspect and these are meant to be touched. Their hair is composed of various fibres- feels very soft, begging to be stroked.Should the hair get tangled a simple matter to replace and/or enhance,even change completely.